Its my hope that you enjoy reading this page on Kilt Scotland photos as much as I enjoyed writing it. 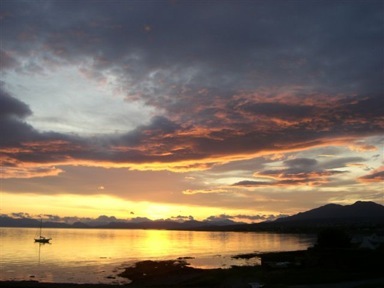 Here is another chance for me to indulge myself with images of my homeland, and kilts in a variety of different tartans. lets start five miles from Forfar, in the quaint village of Glamis with a very famous castle, which has very strong connections with the Royal family. 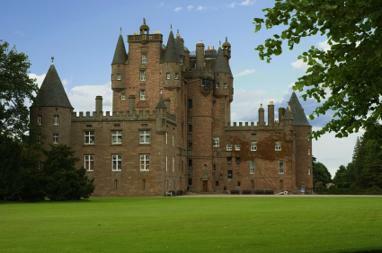 It is none other than Glamis castle, which is the birthplace of the the late Queen Mother. This castle was a firm favourite with the Queen Mother and she spent a large part of her childhood there. The next photo is a firm favourite of mine, its the Greg Street foot bridge, which I've walked over many hundreds of times. 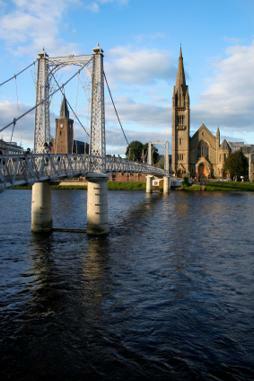 It crosses the river Ness, which in turn runs into Loch Ness arguably one of the most famous tourist attractions in the world. 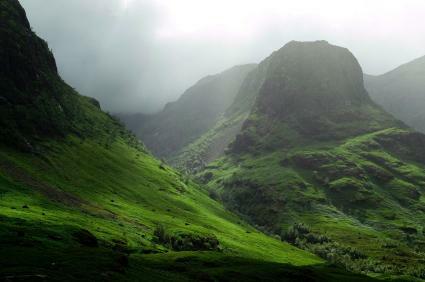 We then have a beautiful picture of Glencoe, which is further proof of Scotland's outstanding natural beauty. 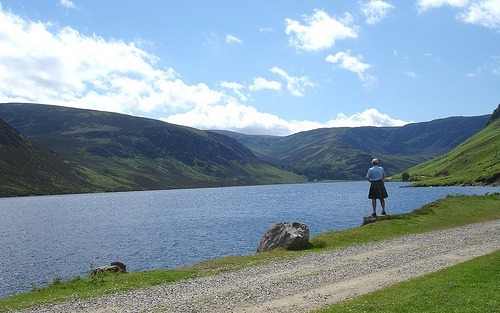 Below is a stunning photo taken at Loch Lee, and standing on the banks you can see a Gentleman wearing his kilt, and no doubt enjoying the breathtaking view. The next four photos have very kindly been sent to me by one of my visitors from America. 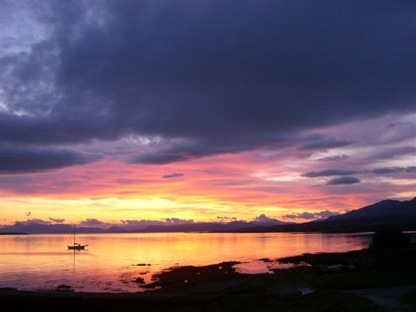 Jim took these four shots from his hotel bedroom window, during a visit to the isle of Skye in 2008. 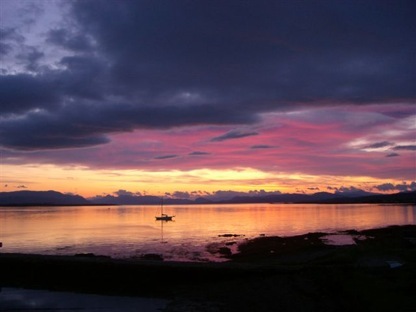 I am sure you will agree with me that the colours and light in these photos are absolutely stunning, and because of this I chose to add them to the kilt Scotland photos page. If you would care to see some more photos from Jim wearing his kilts, then please go to the your kilt photos 2 page where you can see some more from his trips to Scotland. For those of you who love the game of golf, no web-site with a Scottish theme would be complete without a photo of the old course at St Andrews. 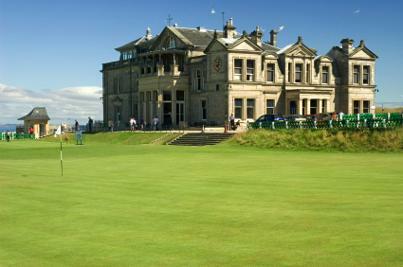 St Andrews is of course the home of golf, and is the venue for the Scottish masters, one of the worlds most prestigious golf tournaments. 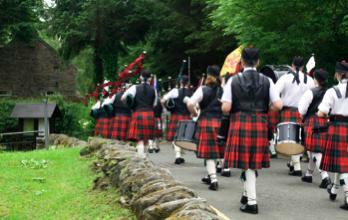 Pipe bands also stir the blood of any Scotsman, not to say that of the many hundred's of thousand's of visitors who flock every year to see the spectacular sights and sounds of the country's culture. 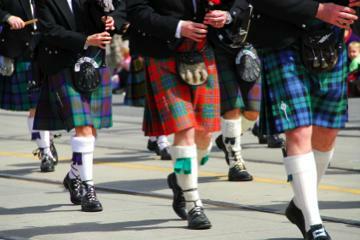 Here's another example which gives you an idea of how diverse the different tartans look on Scottish kilts. 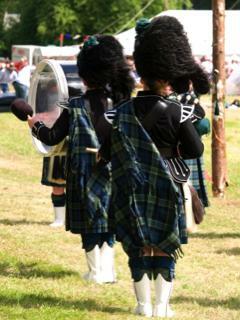 Below you can see two drummers in full regalia complete with bearskins, they are part of a military pipe band, which is also a common sight throughout the country. We will close this page with a picture of Eilean Donan castle, which has the title of "Scotland's most romantic castle", anyone who has been there will understand why. 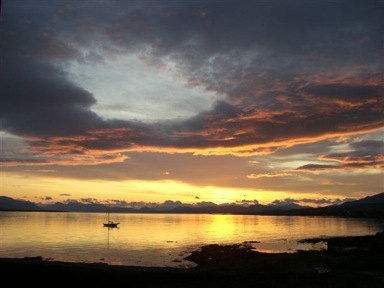 It can be found on the road to Skye, at Balmacara and is the ancient seat of the clan Macrae. I hope you have enjoyed the pictures on this page, but don't forget as beautiful as they are, they can't compare with the atmosphere of the real thing. 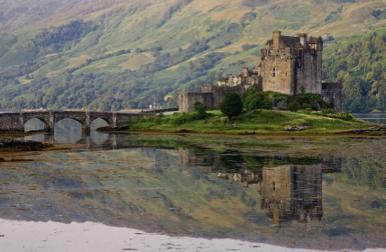 So if your thinking about a trip to Scotland, I hope this page has helped to whet your appetite.